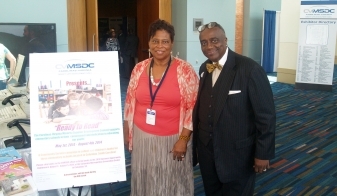 More than 500 Books Donated to Columbia Elementary Schools | DESA, Inc.
On August 4th and 5th, Columbia welcomed the Carolinas-Virginia Minority Supplier Development Council’s (CVMSDC) Business Opportunity Conference to the Capital City. The sold-out, two-day event was filled with awards, information, and business-to-business networking, all geared to help Minority Business Enterprises (MBEs) build capacity. But MBEs were not the only organizations that benefited from the conference; three Columbia schools received more than 500 books. As part of the Council’s “Ready to Read” campaign, the organization held a book drive that collected 503 books that were donated to Hyatt Park Elementary, Watkins-Nance Elementary, and L.W. Conder Elementary. “The CVMSDC is not just about helping MBEs build capacity. It is, and always has been, about building the community, as well. And what better way to do that than by providing books that help young people grow and develop into the next generation of entrepreneurs,” says CVMSDC board member and small business owner, Diane Sumpter. The BOC conference was held at the Columbia Metropolitan Convention Center on August 4th and 5th. The “Ready to Read” campaign collected books from May 1st to August 4th. Books were delivered within days of the conference. For more information about the BOC event and book drive, visit CVMSDC.org. Diane Sumpter, President and CEO of DESA, Inc. and Eric Watson, President and CEO of CVMSDC at the "Ready to Read" book drive.